Peel and cut potatoes into cubes, boil until tender and drain. Put in a 9x13-inch pan. Cut butter into cubes and place along the potatoes and season with salt and pepper. Put sour cream on the potatoes and spread across. 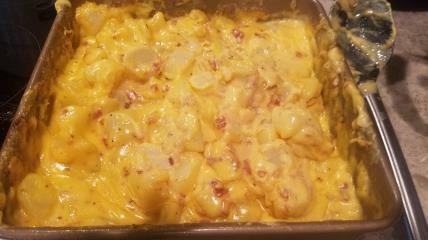 Cut Velveeta Cheese into 9 blocks and place on top of the potato mixture. Bake at 350°F for 30 minutes. Stir mixture occasionally.